Apple launches new iPad with updated processor to replace the Air 2 | What Hi-Fi? 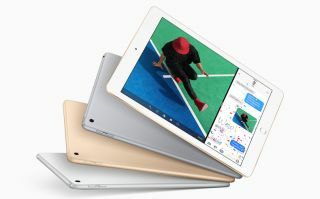 Rumours about Apple's new iPad releases have been circulating for a while, but the company has now confirmed that the first new product will be an updated version of its 9.7in tablet. The new iPad (simply called 'iPad') will replace the iPad Air 2. It's a little deeper and a touch heavier than its predecessor, but the majority of specs remain the same - the only notable difference being that the Air 2's A8X chip has been replaced by the A9 chip we first saw in the iPhone 6 and 6S. Apple claims that the new arrival is actually brighter than the Air 2 but only a proper comparison will be able to confirm if this is the case. Like the Air 2, the new iPad has a 2048 x 1536 pixel Retina display screen, a claimed 10-hour battery life and supports H.264 video up to 4K. Apple has also announced (Product)Red special editions of the iPhone 7 and 7 Plus, with a contribution from each purchase going towards the fight against HIV/AIDS in sub-Saharan Africa. The new iPad is available in 32GB and 128GB versions with wi-fi (£340/£430) or with wi-fi and cellular (£470/£560). The iPad and the (Product)Red iPhones will be available to order online and in stores from 24th March.